Well, nothing like getting the seal of approval from God’s representative on earth. 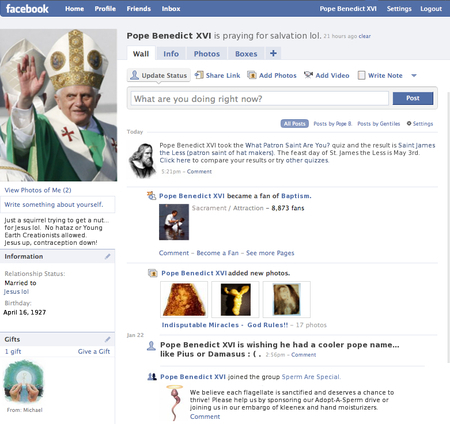 And now Twitter, Facebook and other social networks have got the get-go from the Pope. Last week – proclamation called “Truth, proclamation and authenticity of life in the digital age” The Pope encouraged Catholics to use the internet to spread the good word – establish relationships and build fellowship. However he did warn of the hidden dangers of social networking for good Catholics – and the rest of us, warning against “creating false online profiles out of vanity or diluting the Christian message to achieve popularity”. He may have been alerted to the dangers of fake online profiles by the fake Facebook page for him set up – see screengrab above. The Vatican are apparently also releasing a style guide for Catholic bloggers too… we look forward to that. Aloe Vera Products – Nice, and thanks for sharing this information with us. This is a very informative site. Good luck! I like exploring the experience and knowledge of your exact contemporary. Thanks for sharing information. Post interesting and thanks for sharing. Some things in here I have not thought about before. Thanks for doing the cool-down, which is really good written. I will refer more friends about this. This is one of the charismatic, informatics blog and a good book about life at most that have been described in the special features to help readers and visitors. All information found here is genuine and realistic.